The Nokia 105 may not feature a multimega pixel camera or a touchscreen but its new Nokia 105 phone will cost a mere 15 euros (£13) before taxes.Speaking at the launch of the new Nokia phones at the Mobile World Congress in Barcelona, CEO Stephen Elop, says that Nokia hopes to capture an important part of the market. “We did this because regardless of what you spend on a mobile phone you always want, and you deserve, the very best experience,” he said. According to Pekka Haverinen, the Nokia press spokesperson, the phone also has a very long battery life of up to 35 days on one charge. “You can talk from sunrise to sunset with one charge,” he said. 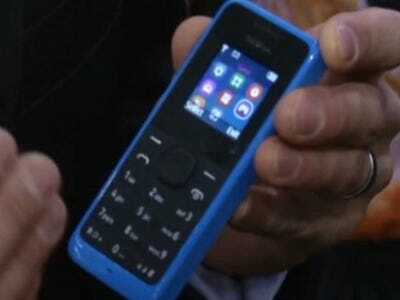 The Nokia 105, which has a colour screen and an FM radio, is expected to be in the stores before the end of March this year. The device is aimed at developing countries but could be popular in Britain as a back-up handset. The company unveiled two new Windows 8 smartphones, the Lumia 520 and the Lumia 720. The 520 is the company’s cheapest Windows 8 handset and has a four-inch display, a 1GHz dual-core processor and 8GB of storage. The 720 is a mid-range device, offering a 4.3-inch display, 1GHz dual-core processor and 512MB RAM. Nokia was the world’s third-largest maker of smartphones last year, according to research firm IDC, but most of its sales consist of older, simpler non-Windows smartphones – a dwindling market.